Calcium is a mineral that helps build strong bones. Calcium is also necessary for many of your body’s functions, such as blood clotting and nerve and muscle function. During the teenage years (particularly ages 11-15), your bones are developing quickly and are storing calcium so that your skeleton will be strong later in life. Nearly half of all bone is formed during these years. It’s important that you get plenty of calcium in your diet because if the rest of the body doesn’t get the calcium it needs, it takes calcium from the only source that it has: your bones. This can lead to brittle bones later in life and broken bones or stress fractures at any time. 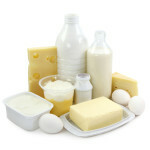 Unfortunately, most teens actually do not get enough calcium in their diet. If you’re concerned about calcium, here’s a tip on how to bring it up with your health care provider: How much calcium do I need?